Geneva, September 12, 2018 -- The continuing development of low-cost, high-performance microcontrollers (MCUs) specifically aimed at intelligent power solutions has created new design possibilities. Taking advantage of this progress, STMicroelectronics and Biricha Digital Power, a leading industrial training and consultancy company focused on switched power design and EMC, have developed a workshop to show power-supply engineers why – and how – to quickly move to a digital implementation. 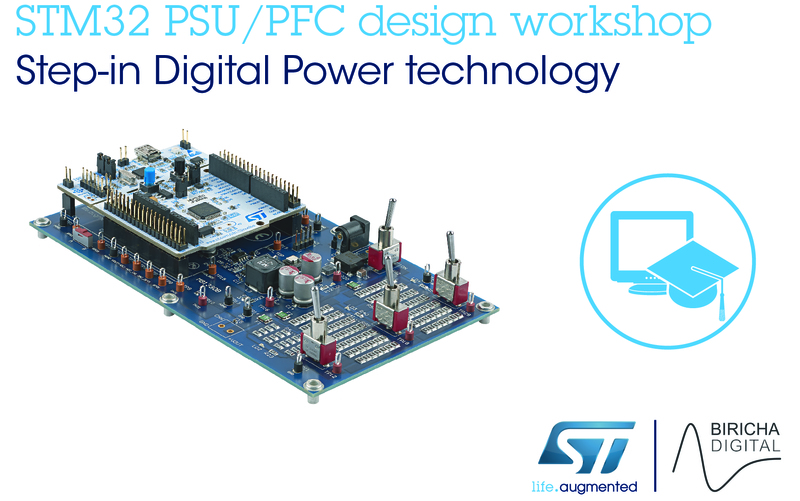 The workshop, aimed at analog PSU (Power Supply Unit) designers and embedded-system engineers who need to build high-performance, stable digital power supplies and Digital PFCs (Power Factor Corrections), will be based on a complementary portfolio of tailored hardware, software, tools, labs and detailed training documentation. This includes the STM32F334 product line (with its high resolution timer – 217ps), a member of ST’s industry-leading STM32 family of more than 800 MCUs covering the full spectrum from ultra-low power to high performance and supporting ecosystem, combined with Biricha’s Power Supply and PFC design software. Key sessions will demonstrate how to quickly design digital power supplies and power factor correction from scratch, and how to design stable digital control loops for both voltage and current mode DC/DC and PFC applications. Workshop participants will get a chance to design, code, implement, and test several digital power supplies. The first workshop, an all-inclusive 4-day course hosted by Future Electronics, is scheduled for November 27-30, 2018 in Munich, Germany.